A birthday is not a birthday without cake- and while virtual photo cake is not as delicious as the real thing- I have never made cake for thousands of people (and if I did, you probably would not want to eat it). 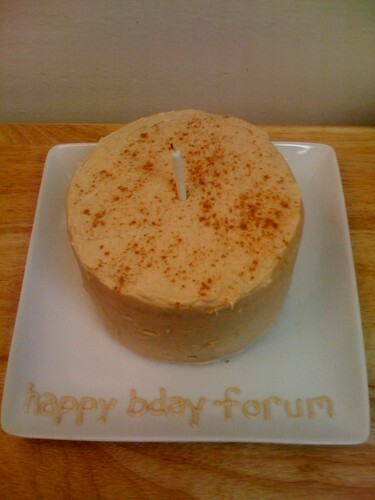 So this little cake is a gesture to say thank you to everyone who helped this little (or not so little now) forum grow this past year. I am truly touched by the generosity that is exhibited here on a daily basis. It makes me proud to be a part of this community. Here is a picture of the completed cake, but if you want to see the process of baking this pumpkin cake, see over here.